The daring author of A Man Who is Not a Man has challenged the conventional once again with his wonderfully original second novel, Here Me Alone. 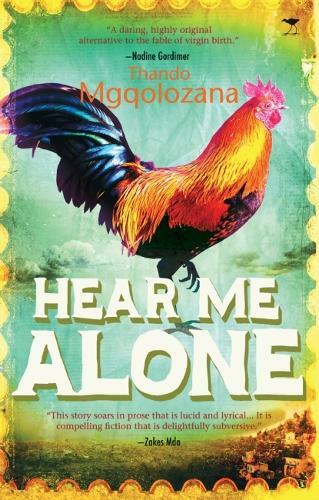 Sticking to his non conventional themes, in Hear Me Alone Mgqolozana offers a possible alternative to the story of the conception and the birth of Jesus as we know it in the synoptic texts. In the narrative Epher returns to Nazareth, where he meets his childhood sweetheart, Bellewa Miriam, who reveals she has been promised for marriage to the woodwork merchant, old man Joseph, and has been visited by an angel, who informed her that she would conceive on that night. Many years later, when the son of Bellewa Miriam had come and gone, Epher writes a letter to his patron and friend, Theophilus, telling him what happened on the night he met Bellewa Miriam, recounting the consequences suffered as a result of this meeting, which he hopes will be included in the bible.